Greenpeace’s Mobilisation Lab helps the organization transition into an era of people-powered campaigns. The right set of tools and an active social profile is helping Greenpeace to better support its community with campaigns that are community driven. NTEN: Tell us about how the MobLab fits into Greenpeace overall. Michael Silberman (MS) and Wendee Parker (WP): We exist to help the global Greenpeace organization transition to a new era of people-powered campaigning shifting from Greenpeace-centric to supporter-centric campaigns. We’re working with staff in nearly 50 countries to design campaigns that enable the full power and potential of over 25 million supporters and activists to help us build stronger campaigns that win bigger. Our team has an independent budget to focus 100% on building capacity, challenging norms, sharing knowledge, and introducing new practices and tactics. NTEN: Who are the Arctic 30, and how and why did MobLab get involved? MS / WP: In September 2013, Russian security agents illegally boarded the Arctic Sunrise in international waters, seizing the ship and detaining all those on board at gunpoint. The ship was towed to Murmansk, and all those on board were locked up in cold, filthy cells, some of them in solitary confinement. They were charged with piracy and then hooliganism, crimes that carried lengthy prison sentences, because they dared to peacefully take action against destructive Arctic oil drilling and the onslaught of climate change, protesting at state-owned Gazprom’s Arctic drill platform in the Barents Sea. 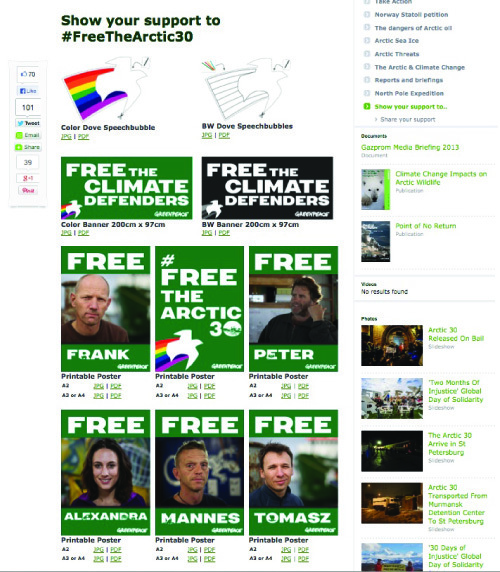 After 71 days in detention, the last of the Arctic 30 have been granted bail release, but severe piracy charges are still pending. We got involved because there was a critical need to ensure that we were doing everything possible as an organization to help free these activists and leverage the global media spotlight to grow the campaign to save the Arctic. We added capacity to test new messages and tactics, and enable a global strategy brainstorm across offices and teams. Understanding how to effectively spread the messages by mobilizing new and existing supporters who connect with this cause through digital channels: thats what its all about. NTEN: This has been a highly charged international incident. How have you baked principles of measurement and transparency into the campaign? MS: We had to determine what could and should be measured. This campaign has been an opportunity to think about some of our limitations to measurement and tracking, and to have everyone really consider whats working and whats not. WP: An informal group from several offices assembled for a week to take a look at our tools and platforms. It illuminated something many of us already knew: that consistency within digital engagement data was lacking. Trying to develop, implement, and execute a standard way to collect, track, and report on those digital efforts is an enormous challenge. The meetings gave us a good sense of our “universe” both the great effort our colleagues were already making in these areas, as well as opportunities to improve towards a complete, holistic point of view. NTEN: Aside from this campaign, are there other wins you can pinpoint in these areas? MS: There are over 100 active Greenpeace social accounts online. Were now seeing organizers include data analysis in their campaign planning. We at MobLab are still pushing, but it wouldnt get completely lost if we werent. Im also heartened by the fact that theres a lot of independent testing happening. People are using Optimize.ly for A/B testing, for example, and then reporting the results to everyone else. WP: The focus and culture has definitely shifted, but the job is not done. Success would be having digital analysis (starting at defining digital analytic goals, implementing digital tracking and analytic tools for ongoing reporting, testing and optimization, ending with a complete campaign wrap up analysis) fully adopted as part of the overall campaign planning process. NTEN: You mentioned Optimize.ly. Are there other tools that stand out as particularly helpful (or that you wish were more helpful)? MS: We have issues with our bulk email tool, which doesnt make A/B testing as easy as it could be. On the upside, were making good progress with Google Analytics and Optimize.ly. On social analytics, were using Radian6, Topsy Pro, and Facebook insights. WP: Greenpeace’s situation is so complex. In every office you may find a different setup for supporter data, a different set of digital engagement tools, etc. Even within offices, data can be fragmented among departments. I’m not sure theres a “one size fits all” solution, but as we work towards a common framework and toolset, it lessens the challenges towards complete supporter data integration a place where all departments view the same data and can have shared goals and metrics. NTEN: Where would you like to see your campaign leaders a year from today with regard to systems and culture? MS: We always want to see the four essentials of a people-powered campaign. The end is not putting data at the center of our campaigns; the end is more engagement-oriented organizing. We put people at the center of our campaigns, but data is an enabling tool. If we can use data to more effectively move people along and support our journey more deeply, thats a success point.